Another year, another edition of JustBrief contest has come to the end. What is JustBrief? Briefly: it is a competition for students interested in marketing industry, who have to create a proper marketing strategy while being placed in randomly selected teams. 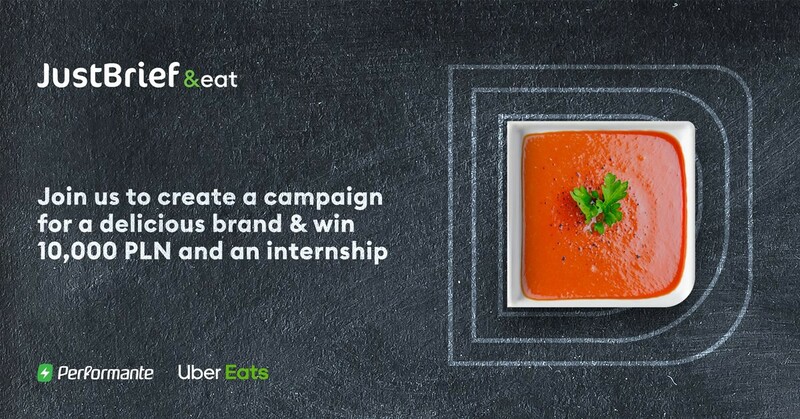 The strategy’s goal is to address a brief provided by a real client of a given edition (this year we had a pleasure to team up with Uber Eats!). All that with the support of specialists from Performante marketing agency. JustBrief is not only a great chance for students looking for opportunities to gain first experience in the field of marketing. As organisers of the competition, apart from improving internal processes, testing new ideas, as well as our personal capabilities, we have established close cooperation with 50 young people interested in the marketing industry, as well as representing the new generation of our future employees. Z’s are slowly entering the market and it is really a mistake to call them Millennials, who form a very wide group of people (from 1980 according to some sources even up to 2000!) growing up in completely different realities. The fact is that they duplicate many of the trends observed in Millennials’ behaviours, such as self-confidence, active use of technology, high expectations for the workplace, and partner-like approach to cooperation shown by their superiors. Why then, according to many sources, the Y generation is dated in such a wide range? People born in the second half of the 90s no longer know the world without the Internet, they are even more courageous and faster, and above all more demanding than older generation. They have a benchmark at their fingertips: Instagram helps them reach images that are not available on Google, and Facebook is mainly used to explore different groups, which are often a source of knowledge that we will not find on Wikipedia. From a young age Z’s use apps in their daily lives. They are communicating not only through a Messenger or Whatsapp: apps as Marco Polo, Holla, Monkey or Airtime are becoming more and more popular. And this is just the beginning of the list of more advanced and competing new applications. For Z generation, it is important to interact with people they already know but also to expand their network of contacts, regardless of where they live. For them, maintaining long-distance contacts in the current time has never been a big obstacle. So what was the purpose of the JustBrief competition? Reaching the young generation that enters the labor market; based on their expectations, lifestyle and our knowledge. finalists’ selection: not on the basis of their previous experience (CV) but on the basis of the completed form. We did not check knowledge in the field of marketing but the ability to create content, combine facts and the natural instinct of an experienced Internet user. assembling ten creative teams of five people. Based on the role selected in the form (social media specialist, strategist, project manager, copywriter or graphic designer), the level of completing the form, as well as the place of residence. workshop on strategy building carried out by the agency, as well as a briefing session from the client. 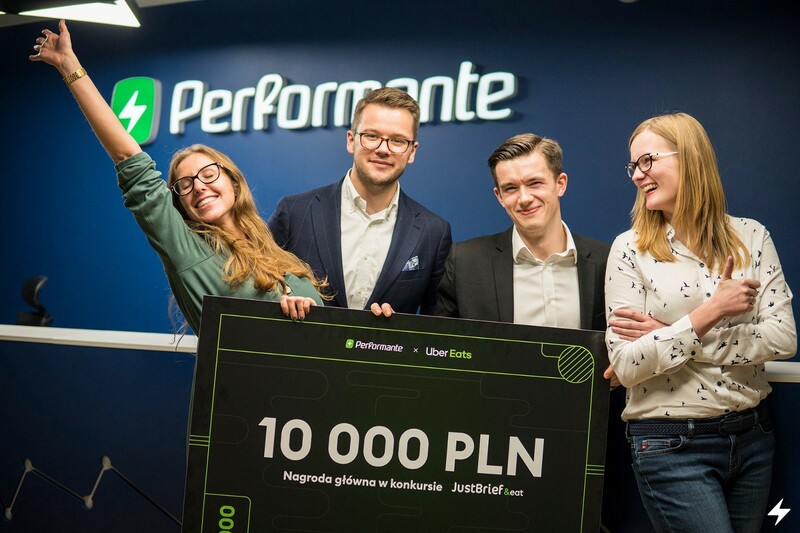 After this stage, all teams were ready to start their work: for 3 weeks they created marketing strategy proposals, being in constant contact with specialists from the agency, as well as participating in consultations during the open day at Performante. During the final, all teams presented their work, while the jury announced the winners. What are our experiences after this intense month of cooperation with generation of our future employees? From the very beginning of the competition, the key was the attitude of various teams to work with experts from the agency — teams that were prepared to talk with us, who asked a lot of questions, were proactive, asked to check their ideas repeatedly, disseminated feedback, discussed with us (they pushed their own opinions and defended their ideas) were much better in the final presentations and in the content of their strategies. Already during the open day at the agency and during the online consultation it was seen which people are involved in the work, understand feedback and want to learn — these people had previously prepared specific questions to specialists, they fully used the given time to consult and to discuss their ideas and approach. This shows that having a longer experience or the conditions for development is not enough — if you want to develop, learn and succeed, you must first demonstrate your initiative, do your part of the job, have the right attitude, open mind and skill to accept criticism, but also to ask for help. Definitely the young generation is very involved in the work, as well as in additional projects like JustBrief but often also expects a much greater commitment and work put in by the other party: experienced colleagues, managers or mentors. Millennials and Z’s went from class to class, from school to school and from exam to exam based mainly on tasks with a key. Not everyone accepts that sometimes the perfect solution doesn’t exist — the client will say one thing, the director of marketing in the agency the second, and the copywriter third and all these opinions are based on completely different factors, often purely emotional, individual, not always understood in terms of incorrect or correct. In the creative industry, there is no such black and white distinction — a large part of our work is a matter of taste, subjective feelings and can be easily commented by saying “I do not like it” or “I like it” without the possibility of giving specific reasons for such an opinion. Knowledge is important but the effect and emotions matter and they can not be classified as “correct” or “incorrect”. Therefore, young people need to be taught that they shouldn’t take every opinion as the only truth, or assume that the boss is not always right and the idea that the whole agency raves about can go unnoticed during the meeting with a client. But it still doesn’t mean that they should not respect a different opinion. What was gained by the teams that had the ability to listen? Better quality of the work done. The key to the truth is to get to know and understand different points of view and compromise. How to strive for this? Thanks to properly constructed, two-way feedback. There is nothing revealing about this, employers are already aware of how important (real-time) feedback is. However, is it practiced? Increasingly, but not always in the best possible form. True, Millennials and Z’s are often claiming, they have high self-esteem, they are accustomed to positive comments and likes, they expect applause, they are a bit insolent, but should we try to raise adults of the young generation by force? It is not about tempering someone’s character but about understanding it and bringing it to the right track. However, it is easy for more experienced colleagues to criticise or express too often negative feedback. Instead of saying that something is pointless, that someone has done everything wrong or approached the case in the wrong way, it is better to appreciate someone’s work, indicate a specific point in which this person made a mistake, explain what it is about, give examples, spend a few minutes to give more explanations. The point is not to prepare someone to receive negative feedback (although this is also important) but to learn to take a different point of view, criticism and be able to identify what could have been done better, at what moment something did not work or did not work as the other person would like. We shouldn’t give a reprimand assessing the previous activities — we can teach instead appropriate behaviour patterns and actions for the future. What can be problematic in this situation? Young people often do not ask. Experienced employees are much eager to ask about something — they have more confidence in their position, knowledge, experience, and often ask for the sake of their own future protection: they know what may be the consequences of under-reporting to a certain extent. Young people don’t want to be perceived as incompetent, they usually look for answers on the internet. And there is nothing wrong with it, if not for the fact that often dissatisfied with the level of communication, the tasks performed, or the feedback they get, they will not immediately communicate it. They describe their dissatisfaction anonymously or online, without worrying about the consequences: after all, they learn it from the early age on the Internet. You don’t need to fight with this — you have to talk about it. Very clearly convey the principles of cooperation, expectations, feedback and ask — is everything clear, whether something needs to be clarified or expected. It is very important to maintain a partner relationship — to understand each other and be fair to each other. After this year’s edition of JustBrief, we can say: we are satisfied and we want more. We are pleased that thanks to this project we can learn so much about our own team and its capabilities but also about the others — about young, future specialists, about Z’s. Directly, intense, black on white. We expect more not only from the finalists of the 2019 edition, from the new brief, or creative strategies corresponding to its assumptions. Above all, we expect more from ourselves — we want to improve as experienced employees, older colleagues and mentors. Such complex and comprehensive projects as JustBrief are not just an opportunity to promote the employer’s brand externally. They are a great opportunity to integrate the team and exchange knowledge within the organisation. Accordingly, by moderating the mutual expectations of both the team and the participants, we are able to learn so much from each other and prepare for the upcoming cooperation.